Meet the people who make it all happen-the planners, the photographers, the musicians who have helped orchestrate the perfect day for countless couples-as they find their own happy endings in the second Year of Weddings novella collection. Grant Nichols is a genius in the kitchen and a klutz on the dance floor. But his friend's wedding is shaping up to be a shindig the likes of which Kings Meadow has never seen-including dancing. Lots of dancing. When Hollis Channing, Mac's high school nemesis, returns to Red Leaf to marry her celebrity fiancé, the editor asks Mac to cover all the festivities for the newspaper. The last thing Mac wants to do is reconnect with the person who made her life miserable when she was a teenager ... unless it's spending time with Ethan Channing, the bride's older brother-and Mac's first crush. 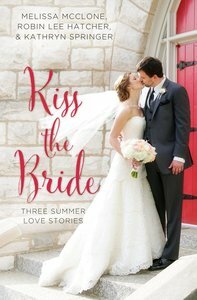 About "Kiss the Bride: Summer Love Stories (3in1) (Year Of Wedding Story Novella Series)"
Melissa McClone has always been a fan of fairy tales and "happily ever afters." She holds a degree in mechanical engineering from Stanford University but eventually decided to follow her dream and write full-time. She lives in Washington with her real-life hero husband, two daughters, indoor cats, and a forty-eight-pound Norwegian Elkhound who thinks she's a lap dog. She also loves to ski, rock climb and read. Visit her online at www.melissamcclone.com.